A robustly built, top quality receiver. Optional memory units store frequency only. This model requires a speaker. A highly respected, collectable model. Accessories: CFL-230 300 Hz Filter, CFL-260 600 Hz Filter, NVA-515 Speaker, CFL-218 1800 Hz Filter, NCM-515 Wired Keypad, NDH-515 24 Channel External Memory, NDH-518 96 Channel External Memory. 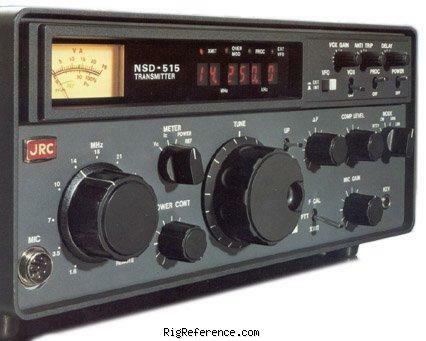 The NRD-515 was designed to match the JRC NSD-515D or JRC NSD-515S. ± 50Hz per hour after 1 hour. ¼" Head. Jack, S-Meter, Attenuator, NB, Mute Terminals, ANL, Line Out Jack, RIT, BFO, AGC, PBT, Speaker Output, MW Tune, Up-Down Tuning, Dial Lock, RF Gain, Int./Ext. VFO Switch. very good receiver, expecially with his loudspeaker NVA 515. Needs a more effective NB and squelch to be perfect. Estimating the value of a rig can be challenging. We collect prices paid by real hams over the years to help you estimate the current value of the JRC NRD-515. Just bought or sold this model? Let us know what you traded it for and help other ham operators!